드디어 브레베 시즌이 시작됐습니다! 스물일곱 명의 참가자들이 전라남도의 따스한 봄날을 즐기며 2013년 시즌의 첫 번째 브레베를 달렸습니다. 참가자들은 한순권님의 샵에서 출발해 북쪽의 고창으로 향했다가 다시 서쪽으로 달려서 동호항에서 바다와 마주쳤습니다. 남쪽으로 방향을 돌린 란도너들은 해안을 따라 홍농까지 갔다가 내륙으로 방향을 틀어 법성과 손불로 계속 달렸습니다. 안장 위에서 하루를 보내고 23명의 참가자들이 제한 시간 내에 한순권님 샵에 도착했으며, 그곳에서 동지애를 느끼며 맥주와 막걸리를 즐겼습니다 (대회 결과). 네 명의 참가자들은 길을 잘못 들거나 컨트롤을 지나쳐서 아쉽게도 공식적인 완주자가 되지는 못했습니다. Brevet season has finally started! Twenty-seven riders enjoyed a warm spring day in Jeollanam-do and rode the first Brevet of the 2013 season. Riders departed from Han's bike shop and headed north to Gochang and then west to hit the ocean at Donho harbor. Turning south Randonneurs followed the coastline to Hongnong where they turned inland to continue to Beopsung and Sonbul. 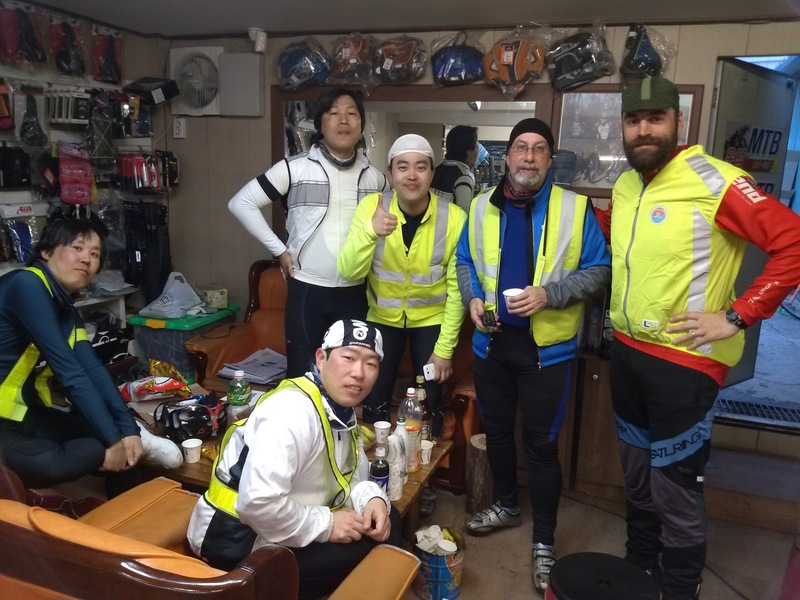 After a day in the saddle all 23 riders arrived at Han's bike shop within the time limit where they enjoyed cameraderie, beer and Makgeolli (막걸리) (results). Four riders took a wrong turn and missed a control and therefore DNQ (did not qualify) as official finishers.